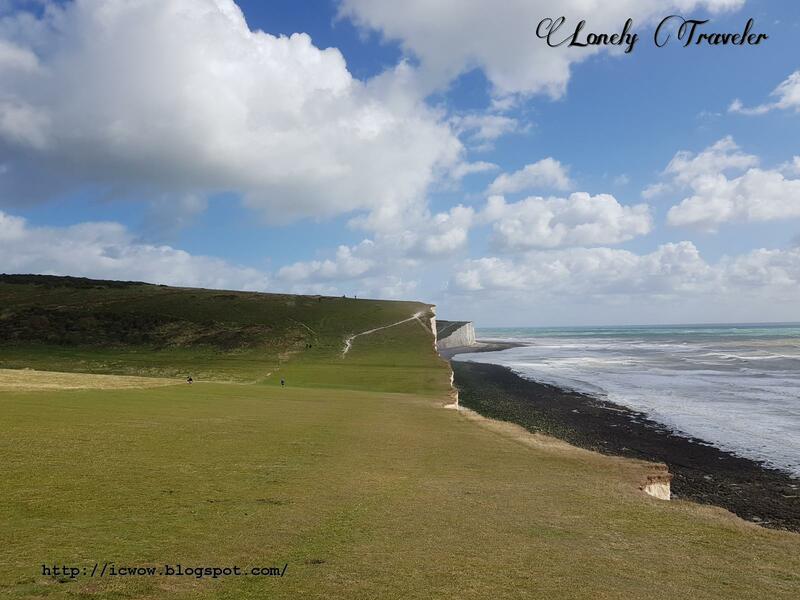 The famous Seven Sisters Country Park is having an area of 280 hectares. 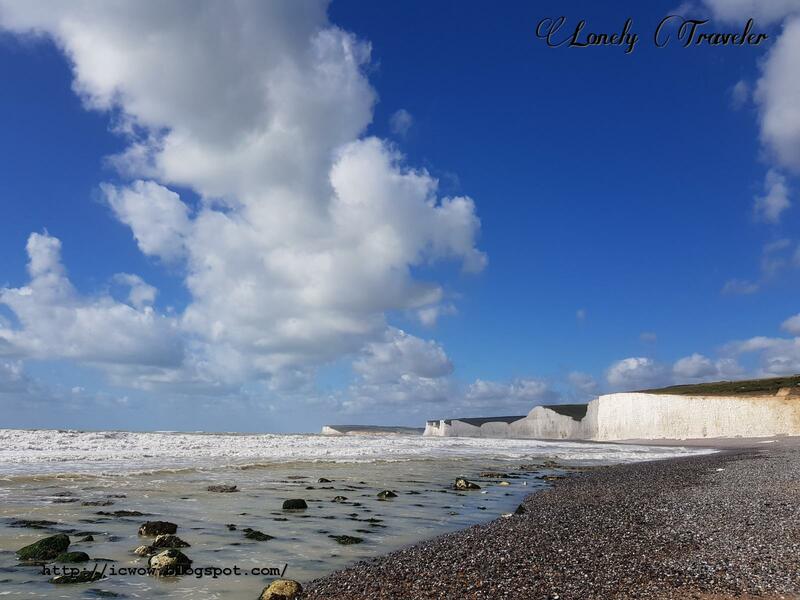 It is having a beautiful series of seven chalk cliffs beside the coastal line. The cliffs are located in between the Birling Gap and Cuckmere valley. The height of the highest cliff from the Seven Sisters is around 250 feet. The name of the cliffs are as follows (from west side) Haven Brow, Short Brow, Rough Brow, Brass Point, Flagstaff Point, Baily's Brow and Went Hill Brow. Everyday lot of tourists use to visit this park for the scenic beauty and to have a cliff walk. You could start your walking either from the Cucumere valley or from the Birling Gap. 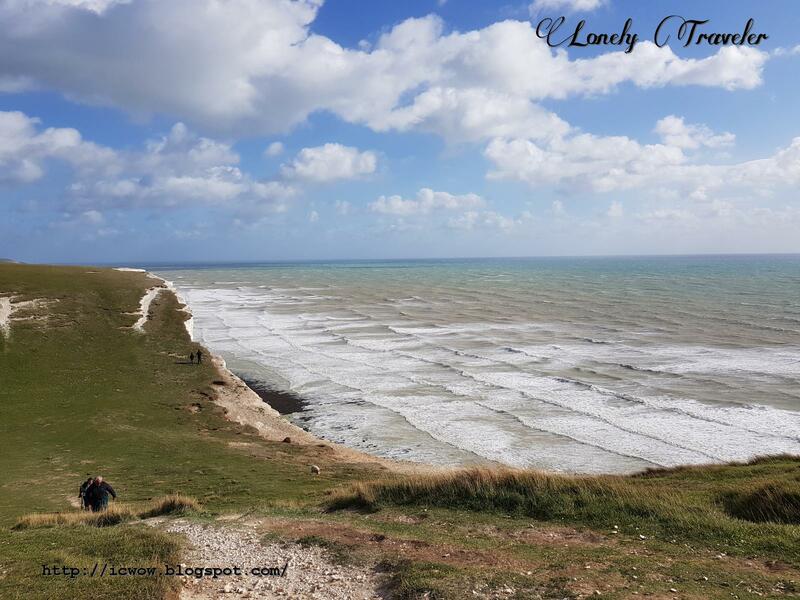 The height of the cliffs would be increasing gradually if you start walking from Birling Gap. Beside the cliffs, a majority of the Seven Sisters Country Park consists of several active farms. You could do the walking around the farms as well if you want. During your walking you'd be able to see plenty of livestock animals (i.e. ships, cows, etc). Also at the Cucumere valley you'd find a gentle walking beside the Cuckmere river (which is falling into the English channel). Lot of people do the walking in a circular path. That means they walk beside the coastal line first and then return back using the path through the farms. We've done only the one way walking and that was beside the cliffs. 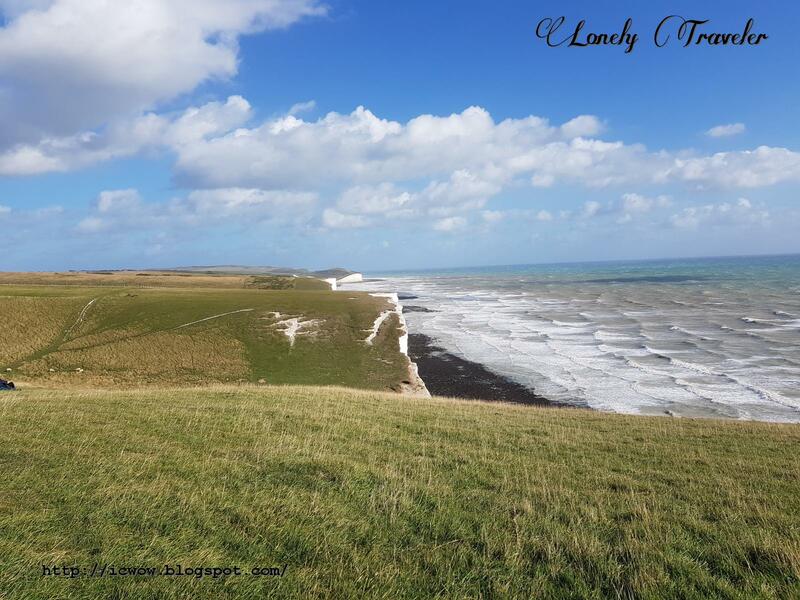 The distance between the Cuckmere and the Birling Gap is more than 3 miles. But due to the heavy wind it took us nearly three hours for a single trip. 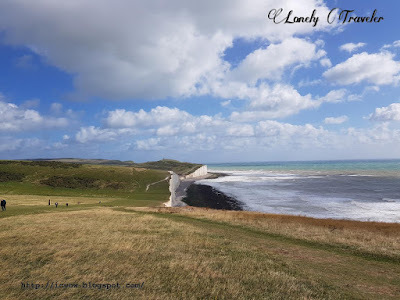 The view of the Seven Sisters Cliffs from the Birling Gap. Using the stair from the Birling Gap we've had half an hour of exploring around the beach. It was a marvelous pebble beach beneath the chalk cliffs. From the beach you would be able to see all the Seven sisters cliffs in one frame. During the summer lot of tourists use to gather here as it has the parking facility, visitor center, toilet, and coffee shop there. People use to have a sunbath here during summer (a few do swimming). For our case it was a cold day. That's why we didn't even dare to put our feet in water. Instead we've been sitting over the pebbles at beach and watching the waves from the high tide. Seven Sisters Cliff with the high tide. From the Birling Gap the Seven sisters country park walking starts. You could take the path beside the coastline or through the farms. We've taken the one beside the coastal line. Due to the heavy wind we had to face immense difficulties during the trekking from that place. The path was only less than four mile in length. But due to the heavy wind it became extremely difficult. The wind was so heavy that we even couldn't stand still in once place. It was continuously pushing us back. So going forward became unexpectedly difficult. People were doing the trekking from other direction and as the wind was behind them it was very easy for them to walk. I guess they were feeling pity for us when they've seen us doing struggle. It was a nice ups and downs path during our cliff walking. Despite of the difficulties the route was heavenly beautiful. We had to cross seven cliffs in total. The cliffs are one after another in a series. It was like you climb the top of a cliff, then descend, and then start climbing another one. So it was like ups and down path. It was very difficult to climb each of the cliffs. And Each one was bigger then the previous one. In between the cliffs we had the green valley (people say the valleys were the ancient river). We had to cross several farms as well during the walking. We've seen plenty of ships during our walking. 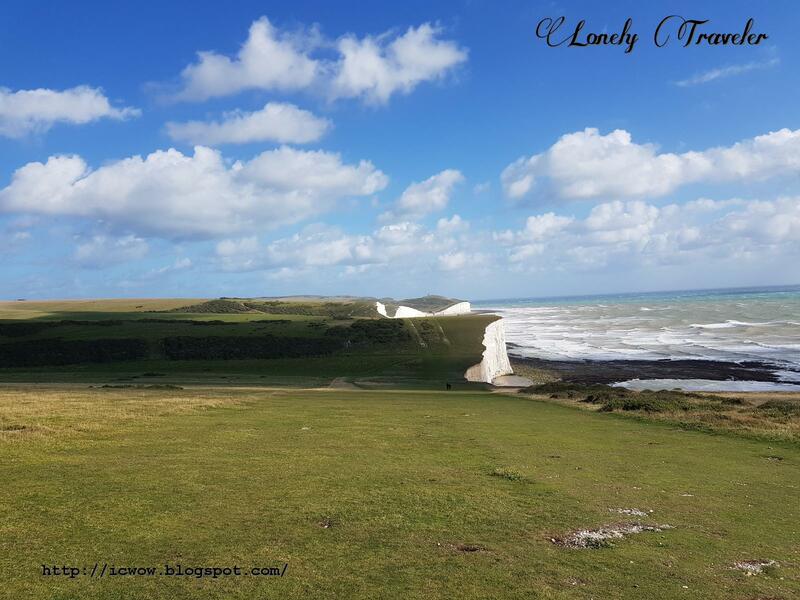 Seven Sisters Country Park has plenty of beautiful scenic view like this. We have taken many breaks during our Seven Sisters Cliff trekking. Some time we were sitting on the grass and taking a relaxing look towards the wavy cliffs. It was a place like we never want to leave but we have to leave to move forward. The ocean was approaching towards the low tide. But It still didn't decrease any beauty of the cliffs. Most of the people was doing the trekking around were having in a small group. 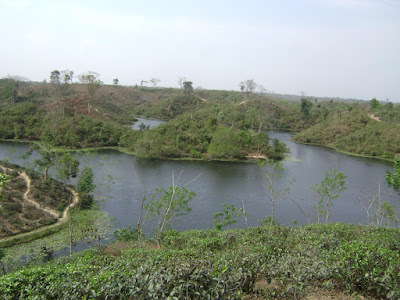 They were not from the day tour groups as they would not give you much time to do the trekking. We can see the Birling Gap from here at far sight. There is a beautiful beach located at the Cuckmere valley (which is just after the Seven Sisters Country Park). We have spent 15 minutes around the beach by wandering around. 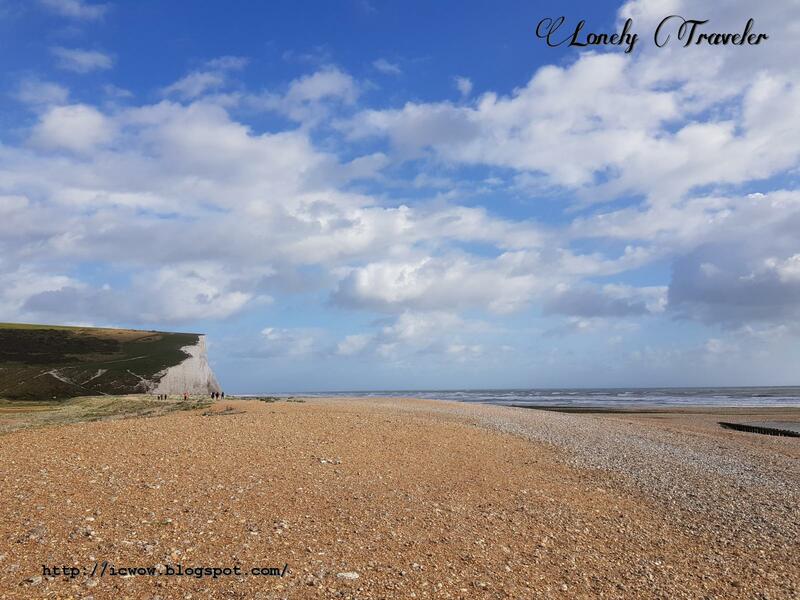 The quiet Cuckmere river falls into the ocean through this beach. Lot of people keep continuing their walking even after the beach. But we didn't have much energy and of course time. That's why we've started walking towards the visitor center to catch a bus for Eastbourne. Ocean was getting towards the low tide. 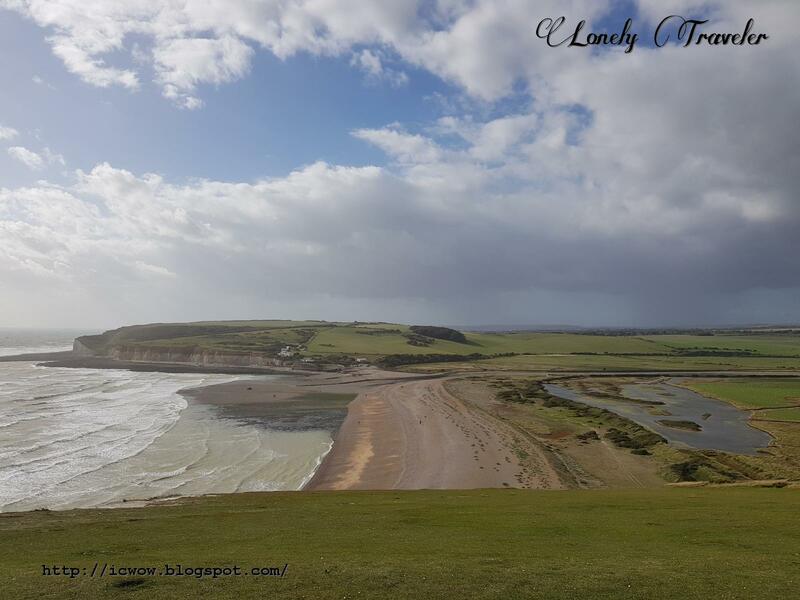 The walking route from the Cuckmere beach to the park's visitor was amazing for its scenic beauty. It was through a typical country side mud path. And the river Cuckmere was beside of us. The color of the sunny sky was reflecting as blue in the river water. Plenty of ships were grazing around. I guess their number was more then a thousands. It was the river, the green valley, and the ships. Around that area there were plenty of tourists as they came there through the day trip buses. From the Cuckmere Inn bus stoppage we've taken the Coaster 12 for the Eastbourne town. It was approximately 20 minutes of bus journey through the farms and the valleys. As we were tired, we were taking some rest and enjoying the beautiful white cliffs. If you are coming from Seaford then it is a few minutes of bus ride to the Seven Sisters Park. That case the bus Coaster 12 (12A) would be an option for you. If you are living in Eastbourne then you can use the same bus too. But that case it would take around 20 minutes. If you are bringing your own car then there is a parking facility available near the visitor center. 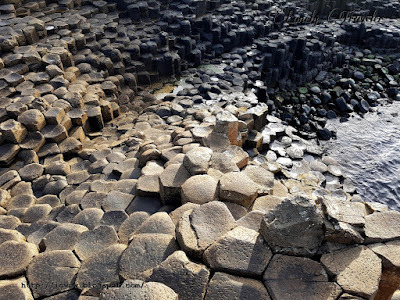 There are several day tour companies who operate a day trip from London. If you are in a tight schedule then you could take one of those. But I'd suggest you to the cliff walking to enjoy the full beauty of the park and cliffs. One of the cliffs got under the shadow of the cloud. 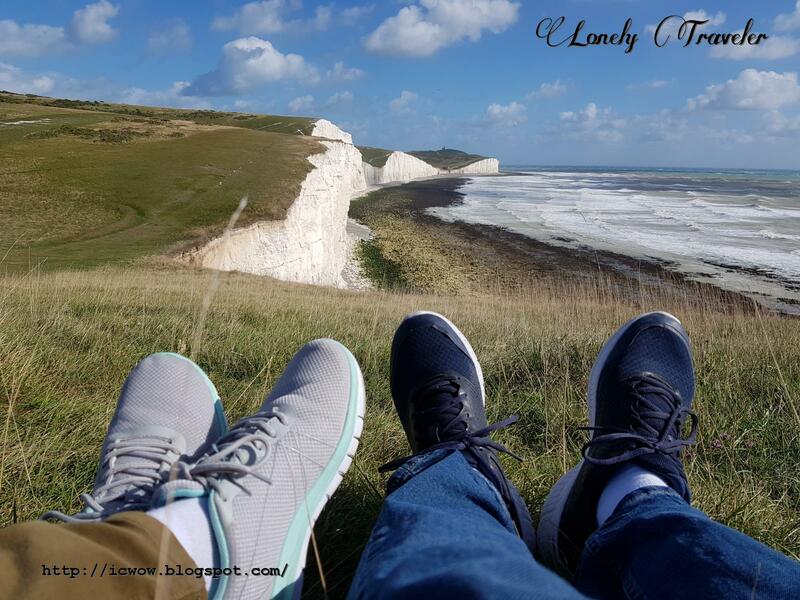 Seaford would be the best option to stay if you are planning to visit the Seven Sisters Country Park. But the number of hotels are not enough in Seaford. That's why I'd suggest you to stay in Eastbourne. That town is having plenty of hotels beside the sea beach which allows the visitor to do some night time activities during night. 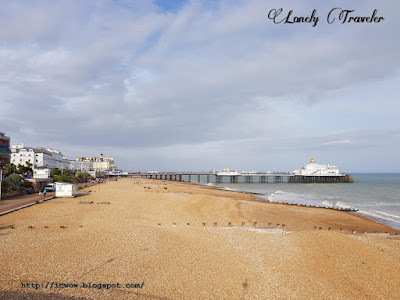 Here are the list of hotels from Eastbourne. There were quite a few number of tourists from different age and gender. The Cuckmere Inn restaurant is close to the visitor center. You could use that for your lunch. Also you could go to the Seaford town too. We are at the last cliff of the Seven sisters. From here you could see the wavy form of other cliffs. The magnificent Beachy Head is just beside the Seven Sisters Country Park. After having an exploration if you have enough energy then you could explore that too. Usually most of the adventurous people visit both the places in a same day. There are some extreme trekker who do the walking between the Seaford and Eastbourne in a day (not for me). Cuckmere beach, where the river Cuckmere falls into the ocean. The edge of the cliffs during a windy day could be risky. Also the edge of the cliffs are sometimes loose and they are not guarded. So always keep a certain distance from the edge of the cliff for your own safety. Also the park consists several active farms. You'd see plenty of livestock animals like cows, ships, etc. If you are taking your dog with you then take an extra care for it so that they don't chase the animals from the farm. Beautiful brown beach of Cuckmere. Cuckmere river with the portion of the cliff. This river looks lively with the colorful weeds around it. A lovely landscape on our way in the Seven Sisters park. Another colorful view of the river. Plenty of ships were grazing at the other side of the river. At the bend of the river beside our mud path. Through this path we've returned to the bus stoppage. A sunny blue sky made the river's color lively blue. These ships were very quiet around us. We were returning home like these ships. Seven Sisters cliff as viewed from the beach.